Our Brown Bag program is simple: No questions, no judgement. Just food. 8:30 am to 12 noon on the second Friday of every month. Gather at 8:30 am to prepare food at Friends Meeting House, 4312 Southeast Stark Street, Portland[MAP]. From 10:00 am to 12 noon, help deliver lunches to folks on the streets. We make 100-150 nourishing lunches on Brown Bag days (with hot homemade soup in cold weather), so anyone we meet can have a good meal that day. And the more of us that show up to help, the more lunches we can give away. Simple. Everyone needs to eat, right? Come lend a hand! No experience needed, just a kind heart and a couple of hours. Please let us know if you can come or if you have any questions. 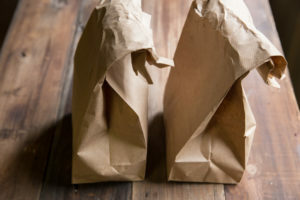 Brown Bags provide hearty meals rain or shine – with warmth, friendship, and respect – so everyone who gets a Brown Bag will have at least one full meal that day. Not a cook or foodie but still want to help? Offer a few bucks. It will help us fill the bags, and that’s a huge help! Each hearty, hand-delivered lunch costs about $3.50, so a $5 gift covers that and more. $25 will get a good meal to 7 people. And $50 will give 14-15 people food that day. Donations to Living Earth are even tax-deductible. Solicit food donations from grocers and bakeries where you shop. Ask friends or local businesses to donate in support this project. We’re a registered nonprofit organization and every donation makes a difference. Contact us for more info.